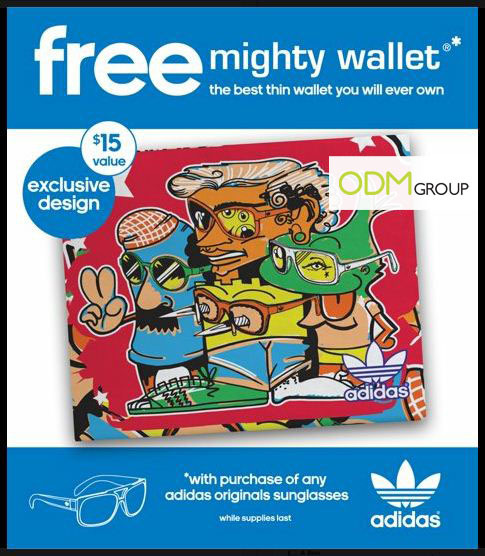 Adidas recently held a joint promotion with Mighty Wallet for a free specially designed paper wallet. This product is made up of tyvek, a stronger and more resistant material than paper. Just purchase any Adidas Originals sunglasses and you would receive this cool free gift. This wallet has 2 slots for notes and even 2 card slots; very much like your normal ones. But the intriguing aspect of this wallet is that it is made up of paper and branded with an Adidas design. What ODM loves about this wallet is that the paper can be easily customized by having any picture or logo printed on it. The item is not very pricey to make either and can be a good promotional gift for marketing campaigns. Adidas has definitely adopted a very innovative design and branding for this promotion. If you are looking for other types of marketing gifts, why not take a look at our Marketing Gifts blog! Here are other related posts!